A set of ads displayed across the TTC for an app called WeedMaps is lighting up controversy over whether the transit agency should be helping marijuana dispensaries generate profits, as police attempt to crack down on illegal pot shops in the city. 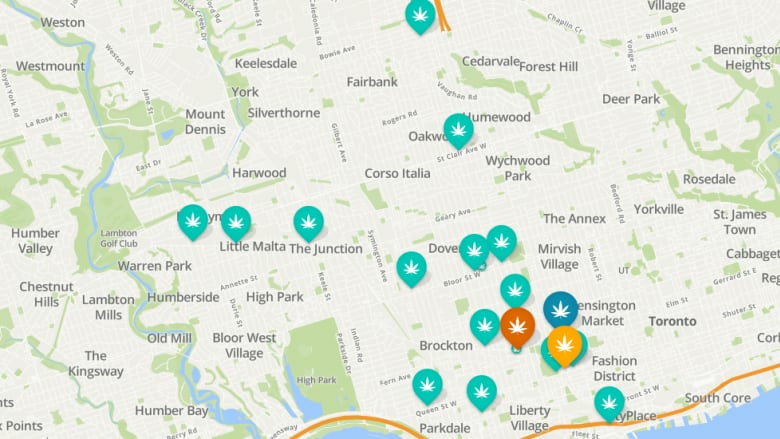 The ads, which rolled out in mid-February, feature a map of Toronto with an array of marijuana dispensary locations superimposed onto it. They are set to be on display for 24 weeks, according to TTC spokesperson Stuart Green. On its website, WeedMaps boasts "the most complete and accurate set of listings in all legal jurisdictions worldwide." The app also features delivery services, prescribing doctors and deals available in the city. There's just one problem: pot dispensaries aren't legal. The TTC acknowledges it's a tricky area but maintains the ad is for the app itself, which is not in and of itself illegal. "We know it's a bit of a grey area in terms of the legalities," TTC spokesperson Stuart Green told CBC Toronto, saying the transit agency's advertising is handled by marketing firm Pattison Outdoor. Green said the firm forwarded the ad to the TTC for review and that the transit agency then consulted with the Advertising Standards Council of Canada before determining that it met the necessary standard. "Medical marijuana is legal in Canada. Under certain circumstances people can use it, so that was taken into account in our decision," he said. In 2016, the number of dispensaries in Toronto saw staggering growth, prompting police to launch a series of raids that led to the seizure of thousands of dollars worth of marijuana. Some shops closed after the raids, but many others simply reopened afterward. At the time, police chief Mark Saunders defended the raids, saying police "in no way shape or form" impeded access to the drug for people who have a prescription to obtain medical marijuana from licensed Health Canada distributors. As it stands now, that is the only legal way to obtain marijuana, he said, adding that the federal government does not issue licences for dispensaries. Instead, licensed dealers send the drug to patients with a prescription through Canada Post. The federal government is expected to table legislation legalizing marijuana this spring, but Prime Minister Justin Trudeau has said police should enforce current laws until that happens. "It's an ongoing issue as long as the law is the way that it is," Toronto police spokesperson Mark Pugash told CBC Toronto. But on the legality of the dispensaries themselves, he maintains, there is no dispute. "The dispensary industry wants people to believe there is a grey area. That's a lie," Pugash said, adding that there can be significant health risks with purchasing from the pot shops such as the presence of insecticides, rat feces and mold as a result of a lack of quality control. That's not to mention the sometimes violent robberies of the storefronts, he said. Pugash wouldn't comment directly on the advertisement campaign running on the TTC. In an email to CBC Toronto, WeedMaps said it has been advertising in Toronto since November 2016. The company says it has 50 billboards through the city, as well as 75 subway signs, three bus murals and five ads on the back of buses. WeedMaps also advertises in Vancouver and Montreal, saying it recently launched 20 billboards and 20 bus shelters in each city. The TTC says any advertisement that generates five or more complaints is sent to its internal advertising review board either to be modified or taken down. So far, Green says it's received no complaints, but that legal staff is reviewing the ad to ensure it's compliant with the transit agency's standards. "We're not going to pass judgement on anything but the ad itself," he said. "The ad is for an app, which in and of itself is not illegal."